Q: What organisations can sign up? Q: What information will I need to sign up? A: We’ll need some key pieces of information to get you registered as a good cause on the Love Blaby Lottery. This will include your organisation's name, key contact and role, address, telephone number and email. We will then need you to confirm your eligibility (see question above). In order to pay you your money we’ll need your bank details and you’ll also need to provide a logo for your organisation to include on the specific marketing materials we’ll create for you. You can provide these at signup but they aren’t required to get you registered. Remember to tell us if any details change. Q: What kind of logo do I need? Don’t worry if you don’t have one, we’ll set you up with a default logo to start with and you’ll be able to change it and any other details at any time. Q: What materials do you provide to help me promote my lottery? A: We provide your good cause with its own tailored communication materials. These will be professionally prepared PDFs which can be attached to e-mails that are sent out to your community. Our materials can also be printed and posted around the local area. We also provide you with your own dedicated webpages on the www.blabylottery.co.uk website for your supporters to sign up, check results and see how much money is being raised. Q: How do winners find out that they've won? A: Every week, all winners will be advised by e-mail. The winning number will also be published on our website, Facebook and Twitter each week following the draw. Q: How do we receive our share of ticket sales? A: Your funds will be transferred directly into your bank account every month. Q: How do I know how well my fundraising is doing? A: Every week we send you a newsletter which provides you with all the details. It tells you how many supporters have chosen to direct their support to you, who they are, how many tickets are being sold each week, how much money has been raised etc. There is also a dashboard on the site which will provide real time statistics on your campaign! Q: Who deals with any questions my supporters have? A: We do! We have a dedicated support number (0116 3800775) that deals directly with any queries your supporters have as well as our support email address ([email protected]). Q: Can someone still play if they are not online? A: Yes. Players can call the dedicated Love Blaby Lottery number – (0116 3800775) – to register and set up payments. Q: What administration do we need to do? A: None! All you need to do is shout about your Love Blaby Lottery page! 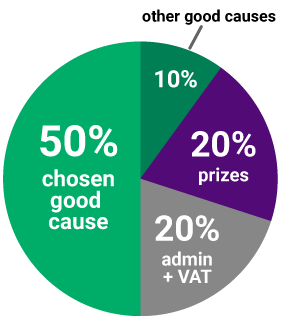 Q: If my good cause gets 50p per entry, where does the other 50p go? A: 10p is used to support other good causes within Blaby District. 20p goes to prizes and the remaining 20p is for administration of the lottery and VAT. Q: Can supporters use Gift Aid on the ticket price? A: Unfortunately you cannot claim Gift Aid on lottery ticket purchases.